For this post, I’ve gone into my archives and updated one of my earliest articles. 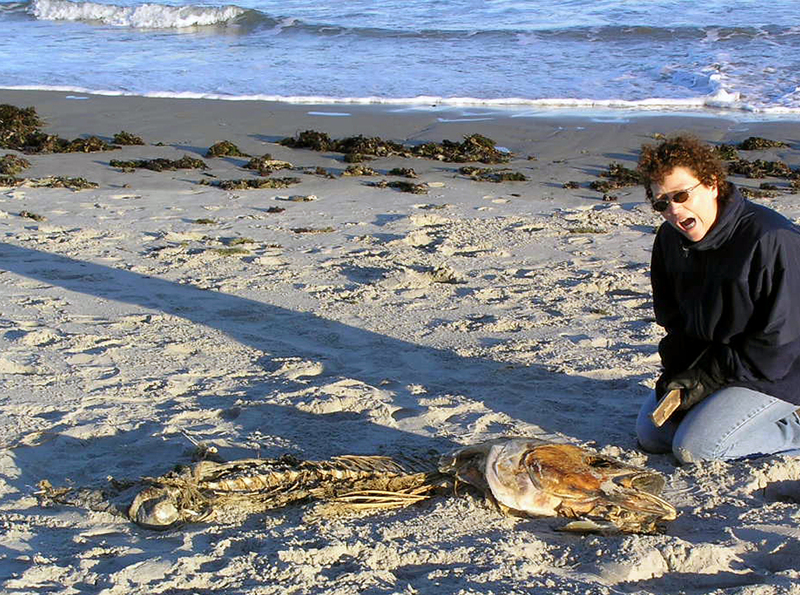 Here’s a photo of me on the coast of Maine with a treasure I found washed up on shore. Seeing the not quite picked-clean bones of this huge fish reminds me of similar encounters at a time when I was young and innocent, playing in the sand with my silver spoons and plastic bucket, trying to dig to China. I remember how sand crabs skittered about while I dug deep holes that filled with ocean water seeping in under the beach. I remember finding the shield-like remains of a spiny horseshoe crab with its stiff dagger tail. And one peaceful afternoon, two men dragged a large thing through the surf and onto the sand nearby. A sleek, grey, smooth-skinned body with a long tail, and side and dorsal fins. I was little and the thing was huge, and it was a shark. That creature laying on the sand made me wonder what else swam out there in the deep, among the rushing waves just beyond the shore. What else was out there that I couldn’t see? Close enough for swimmers to capture, close enough to swim among the swimmers. I decided I didn’t want to be one of those deep-water-swimming-with-creatures kinds of people. I’m perfectly happy to watch the waves for hours, feel my toes leave impressions in the warm sand, smell the salt in the air, hear the gulls cry. At peace with the forever cycle of sea meeting land in a rush and swell, a falling back, and a reaching out once more. The sea and me, we have an understanding: if I don’t go in too deep, it won’t eat me alive. It’s not the fear of drowning that keeps me rooted in ankle-deep surf. I can swim just fine. No, it’s the things in the water I can do without. And I’ve always been okay with this perfectly logical fear I have. Then I took my oldest daughter on a Caribbean cruise for her 21st birthday. We explored Mayan ruins in Cancun, hiked through a waterfall in Jamaica, visited a place called Hell. It was all wonderfully normal, until she wanted to swim with stingrays. AND she wanted me to join her. How sweet of her to think of me. The water would be warm and clear, she said. Clear enough to see all those creatures living in the ocean. At the time of the cruise, I hadn’t been introduced to AJ Jackson (of This New Mountain) and her head-on approach to dealing with fear, but I knew deep down if I let go of this chance to share something remarkable with my daughter, I would always regret it. And a part of me actually did want to [shudder] swim with stingrays. I talked myself into it and out of it dozens of times. I was still talking to myself as I followed my daughter down the ladder on the side of the sightseeing boat. I changed my mind again, but I couldn’t climb back up, someone was already clanging down the ladder above me. My heart pounded. I tried not to look at the water below as I stepped onto the bottom rung. To keep from hyperventilating, I had channeled deep Kung-Fu-Lamaze breathing for a good fifteen minutes up to this point. No other options presented themselves besides shoving the person above me off the ladder. I took a few more slow, even breaths, told myself to just do it, and dropped into the warm ocean. I expected to have to push off the bottom and swim to the surface, instead I touched solid “ground” after a few feet. The water resting over this pristine reef was only armpit deep. The sand spread out at my feet soft and white and unmarred as far as I could see. No shells, no seaweed, no creatures, nothing but sand. It was as if someone had swept it clean just for me. This wasn’t so bad. I could do this. Soon a murmur started from a group of people bobbing in the calm farther away from the boat and me, and closer to the open sea. Shadows slid through the water, dark cloaks winging toward us. I screamed along with everyone else – tenor and soprano voices mixed together, men and women alike. But these stingrays were not there to hurt us. They were more like dogs racing in for the treats the tourist boat always brought along to bring them close. The rays hugged our legs and spun around us. My daughter, the adventurous child, hugged one back. I stood as still as possible and took photos of rippling cloaks and tiger-eyes unblinking. Soon the creatures turned and swept back the way they came. I still don’t like deep water, won’t go in it, preferring slow walks along the edge of my mind and the surf. I’m comfortable with this fear, its limitations and its limits. I suppose I’ve always known that some things are more important than fear, I just don’t like to have to practice that particular piece of wisdom. But now I can say I swam with stingrays – and I never have to do it again. Is there a fear that keeps you from doing something you’ve always wanted to do? Is it time to take a few deep breaths, pull yourself up by your bootstraps and jump in? This entry was posted in Fear Less Fridays and tagged Ambrose Redmoon, courage, facing your fears, fear less, lessons from life, living life to the fullest, swimming with stingrays by Cate Macabe. Bookmark the permalink.